Several historic structures are grouped together on a 2970 square meter (32,000 square foot) site known as Cap Moderne. 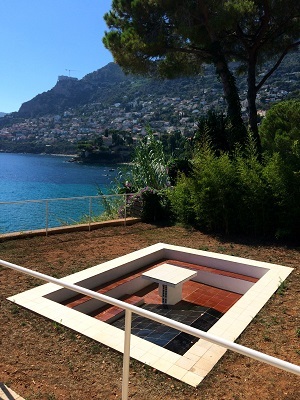 The architect Le Corbusier built his Cabanon or vacation cabin here, along with a tiny office, a Camping Unit for visitors, and even a small restaurant, known as the Etoile de Mer, or Starfish (which I mentioned just above the recipe of a previous post). 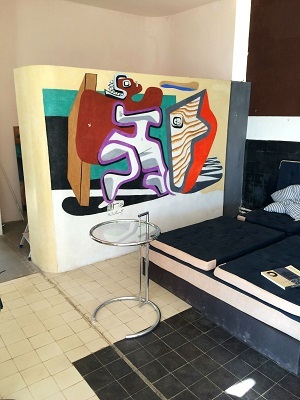 With no offense meant to Le Corbusier – who I’ve written about here as well – for me, the real star of the site is the modernist Villa E-1027. 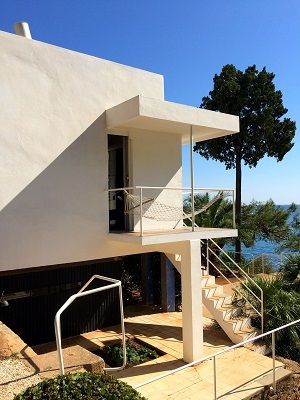 Irish designer Eileen Gray created the holiday home for herself and her companion and colleague Jean Badovici, and it’s built right into the restanques, or land terraces, that are so typical of the area’s topography. Along the same lines as Art Nouveau artists before her, Eileen Gray was a “total artist,” practicing painting, cabinet making, furniture and interior design, architecture, and photography. In fact, just last night, I was racking my brain with a friend who designs interiors for movie sets: we were trying to think of a current designer who creates “total works” or œuvres totales: Clémentine suggested Philippe Stark. Like Starck, Gray’s design trajectory evolved throughout her whole lifetime. After a stint creating lacquered pieces, Gray moved to Paris to set up shop in 1902 and turned to designing other types of furnishings. The first time I saw her creations was at the Villa Noailles, where Gray’s ability to design “ingenious fixed and mobile furniture” was evident, as it is in the Villa E-1047. But what about the villa itself? Built between 1926 and 1929, Villa E-1027 is a shining example of Gray’s œuvre totale, and was designed in the cruise-ship style or style paquebot, popular in the 1930s, especially among fellow architect Robert Mallet-Stevens. The house featured not only Gray’s signature dual-position furnishings, but also a solarium, or sunning area, right, and lots of cleverly designed openings, like the windows that open in an accordion style, pictured below. The holiday home is what Badovici termed “living architecture” – which in this case I interpret to mean “architecture I’d like to live in.” When visiting historic homes, I can let my imagination run wild: at Villa E-1027, I pictured myself spending entire mornings reading while swinging in the hammock overlooking the azure waters of the Mediterranean, or eating outdoors on the lower garden terrace in the evening, serving to friends large platters of fresh fish on one of Eileen Gray’s elongated tables. In fact, most of my historic home visits are really just a live version of online real estate voyeurism, which I practice often on weekends by browsing the French web site De Particulier à Particulier. My fantasy at Villa E-1047 also involved grilling Mediterranean grouper or sardines under the shade of the citrus trees in the villa’s outdoor kitchen. Or I’d serve Ice-cold avocado, crab, and cilantro cocktail, according to the recipe below. 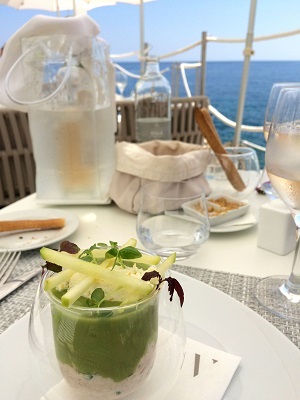 To visit Cap Moderne, reservations are by internet only, and visits fill up early in the season. Click here for information on availability and to reserve a 2½-hour guided visit in English, or here for French. The E-1027 table is part of the Museum of Modern Art’s permanent collection in New York, but those interested in owning a reproduction fabricated by Aram can buy one here. And compared to the other Gray reproductions on the web site, the table isn’t terribly expensive! The day after our visit to the Villa E-1047, my man and I decided to hike the Cap Martin, along the Promenade Le Corbusier, which winds its way around the cape past little turquoise swimming coves and rocky outcroppings – overlooking Monaco or Menton, depending on which side you’re walking. We swam with masks, ogled fish (ever more hungry for it), and then hiked in the sun, with only waves and the incessant chirping of cicadas as the peaceful soundtrack to our walk. The restaurant/beach club was a little more jet-set than we’d have liked: we were the bumpkins in bathing suits, crashing the wealthier-than-thou party. But that’s the good thing about living in France: contrary to what you might think, you will never be refused service because you’re not wearing a tie. Or even a shirt, for that matter. So we stopped for a bite, and I sampled the restaurant’s Ice-cold avocado, crab, and cilantro cocktail. It was probably made with Mediterranean green crab, or crabe vert, but at home, I used rock crab (known as tourteau here in France) because it’s easier to find in Paris. One thing that isn’t easy to find in Paris is already-picked crab meat. On the East Coast, where I come from, fresh-picked crabmeat is always stocked in the cooler of any decent fish shop – boy, do I miss fresh Maryland-style crab cakes! So if you’re making this in Paris, you can find fresh-picked crabmeat at Petrossian, but don’t expect all that work to come cheap! Otherwise, buy a demi-tourteau, or half rock crab (or even just the claws) at your local fish shop, and ask your fishmonger to show you how to pick it, or read this article – the technique will also work for the tourteau. 1. Cut the avocadoes in half and remove the pit. Scoop all the flesh into the bowl of a blender or food processor. 2. Cut one end off the apple half, and place it in a bowl, cut side down, with 1 teaspoon lemon juice – you’ll use this to make little matchsticks for the decor. Peel and seed the rest of the apple, and add it to the avocado. 4. When you’re ready to serve, reserve 4 pretty cilantro leaves, and finely chop the rest. In a medium bowl, mix together with a fork the chopped cilantro, crab meat, olive oil, the remaining 1 teaspoon lemon juice, and salt and pepper. 5. Gently pour or spoon the avocado puree into 4 cocktail glasses, and then very gently spoon about ¼ cup of crab on top of each portion. Finely slice the piece of apple you reserved in the lemon juice to make 8-12 matchsticks (or cut them in the shape of your choice). Place them on top of the crab, and decorate with the cilantro leaves. Bon app’! What a fantastic article. I feel like I just went on a vacation. And I can go back for more looking at all your underlined notes! Just wonderful. One of my dreams is to eat at a long table near the water. Ok, in the back yard. I look forward to your next article and recipe. I can’t wait! :) That’s me smiling while reading this article.... “living architecture” – which in this case I interpret to mean “architecture I’d like to live in.” :) ... real estate voyeurism.... I do this too!!! I want to make and eat the cocktail, right now!